My niece turned 7 last May 2 and here's the 7th Birthday Invitation that I made for her. 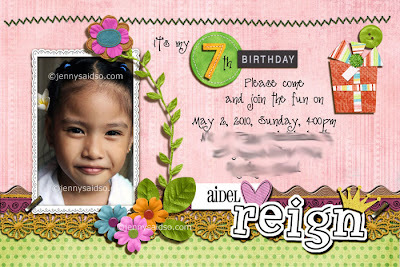 Since I'm a digi-scrapper, of course I made use of the elements and papers from digi kits. Isn't it cute? It's far different from the usual 7th birthday invitation that we see. The size is 4x6 and we had it printed at the photo processing shop which I think is Php6.00 each. My SIL in turn made a separate paper that includes her 7 roses, 7 candles and 7 gifts.